ABC Television. 1956. Original Producer: Rex Clayton. Producer: Ivan Chapman. 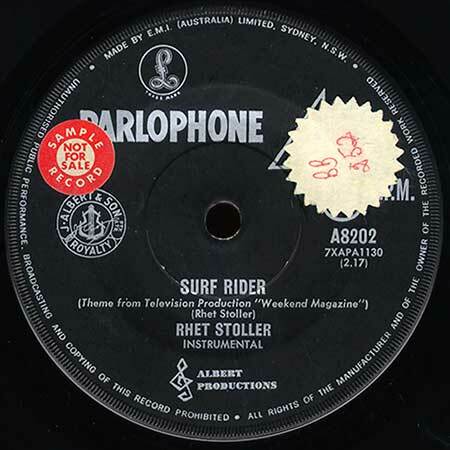 “Surf Rider (Theme from Television Production “Weekend Magazine”)”.(2:17). (Rhet Stoller). Rhet Stoller - Instrumental. LP(t) (AD)	BBC (UK). REH 348. 1979. “SPORTING THEMES”. S1-Tk6 “Surf Rider”. (Rhet Stoller). (Stoller/F.D.H.). LP(t) (AD) (See COMPILATIONS - TIMELESS LAND AND OTHER GREAT TV THEMES, THE: S1-Tk2). LP(t) (AD)	(See COMPILATIONS - T.V. THEMES - VOLUME 1: S1-Tk2). CD(t) (ST)	(See COMPILATIONS - ABC TV THEMES: CD2-Tk14).